Yesterday evening I was reading a print edition of the Greek text of Luke 19:28–44 (NA28), and I realized at one point that the pagination effected me as a reader. The medium effects interpretation. Let me briefly explain. I am reading the story of the Triumphal Entry in the Gospel of Luke, following the disciples into a village where they find a colt just as Jesus had told them. A few lines later I am following Jesus who is descending down the slope near the Mount of Olives, riding on this colt, preparing to enter Jerusalem. At this point (v. 41), the NA28 has its first new paragraph since v. 29 marked by a new indented line. The new paragraph begins, “And as he [Jesus] came near, when he saw the city, he wept over it . . .” Complete sentence. No punctuation. End of line. End of page (of main text). Now the sentence goes on in the next verse which is a dependent (participial) clause containing a bit of commentary from Jesus regarding the state of the city. 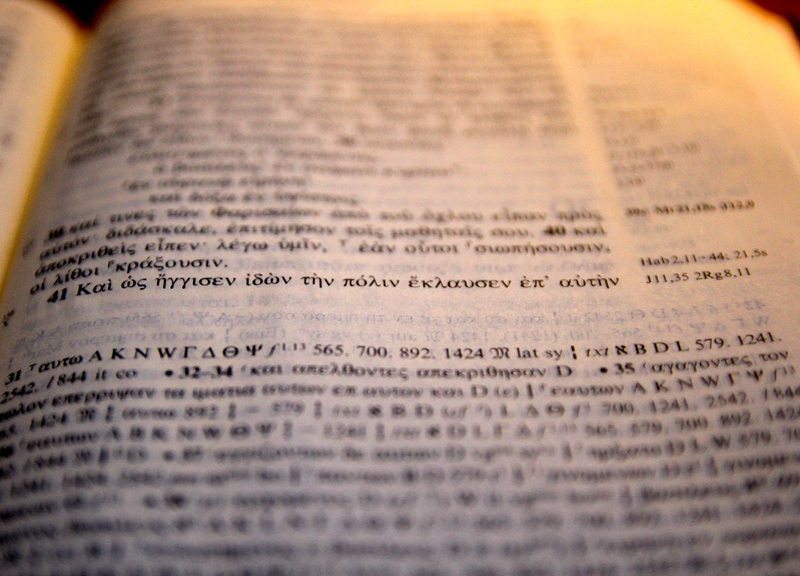 But to move from the last word of v. 41 (αὐτὴν) to the participle of v. 42 (λέγων), the reader must flip the page. Coming to the end of the page created an extra moment for my mind to process what I had just read. The contrast between the praise of the disciples as Jesus approaches Jerusalem and the weeping of Jesus at the sight of Jerusalem is particularly striking, especially given the extra moment of reflection. I didn’t flip the page immediately. I reflected on this for another moment. Now, there were a few other factors contributing to this effect besides only the pagination: (1) The indention of v. 41 sets it off, even if slightly, from what precedes; (2) The verse is a complete sentence even though it has no punctuation; (3) The word order of v. 41, which my own translation above roughly preserves, saves the ‘weeping’ for the final third of the sentence, thus it becomes the note, as it were, that ends the page. Certain features of print media, some of which are not often present in digital versions, can effect the reader (e.g., pagination and paragraph formatting). The same goes for digital. Some digital editions lack any kind of typical paragraph formatting. Some programs that display digital text allow the reader to remove all references (numbers, notes, etc.) in the text to produce line after line of sola textus. Often, the digital text fills the window that contains it, even when that window’s size is changed. The text often has a scrolling feature, so one never quite reaches the ‘end’ of the ‘page’. I’m not arguing here that one medium, digital or print, is better than the other. I am just pointing out that the medium affects the reader’s experience, and therefore to some extent, the interpretation. ← CSNTM New Mss. including complete Greek NT Ms.
Oh man, I just presented at a conference in Seattle called BibleTech, hosted by Logos Bible Software. I’m sure you’re familiar. Technology definitely affects the Bible and our interpretation of it. It’s great to see that you’re thinking about these issues. If you’re interested in exploring it more, here’s a link to our slides and a recording of our talk. It’s about 40 minutes. Thanks for this, Adam. Let me know when you’re in Edinburgh :). I don’t know if you’re interested in this, but when I worked on my chiasmus for Mark (whether it’s right or wrong is beside the point), I actually made a scroll for Mark. I found it much easier to use in my search for Mark’s chiasmus. It certainly beat having to flip back and forth through pages – which was just plain annoying (not flipping enough pages, flipping too many, flipping back and forth – zeroing in on the passage, turning a page to continue a story, etc.). I had the scroll rolled out on a kitchen counter. Soooo much easier to go back and forth between matches – to see and work with the chiasmus. It was definitely the way to go – imho. …. …. Some of course think the codex aided in ‘killing’ the art of chiasmus. …. Hmmmm. Baaaaad book. Lol. Interesting. I have thought about this (i.e., how a scroll might affect structure and layout of a text) before. One might argue that it is more difficult to move across large portions of text using a scroll rather than a codex. I suppose every mode of writing has its affect on the reader / writer. Blogging seems to have added another slight change, where new writing is added to the top of a collection of writings. Does blogging, thanks to the new digital world, represent something new in structuring writing – where you add to the top rather than the bottom? I agree. Every mode of writing has an effect, even if subtle.